Great review of “Long Walk Home” in the June 13, 2013 edition of Blues Blast Magazine! 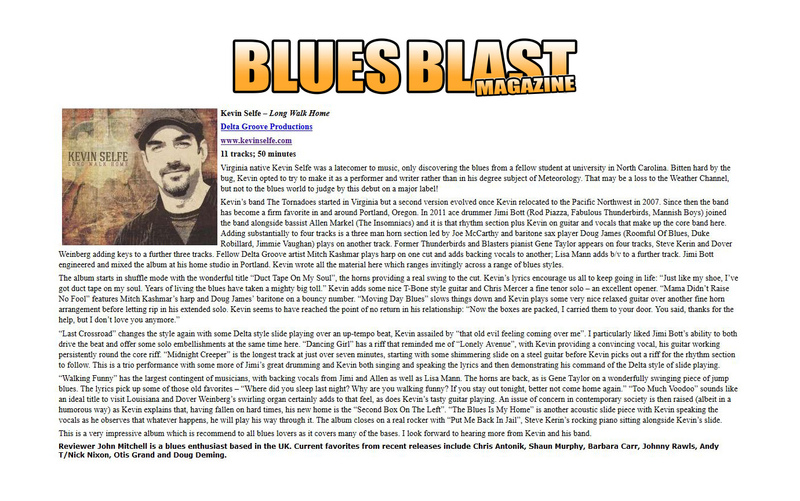 Virginia native Kevin Selfe was a latecomer to music, only discovering the blues from a fellow student at university in North Carolina. Bitten hard by the bug, Kevin opted to try to make it as a performer and writer rather than in his degree subject of Meteorology. That may be a loss to the Weather Channel, but not to the blues world to judge by this debut on a major label! Kevin’s band The Tornadoes started in Virginia but a second version evolved once Kevin relocated to the Pacific Northwest in 2007. Since then the band has become a firm favorite in and around Portland, Oregon. In 2011 ace drummer Jimi Bott (Rod Piazza, Fabulous Thunderbirds, Mannish Boys) joined the band alongside bassist Allen Markel (The Insomniacs) and it is that rhythm section plus Kevin on guitar and vocals that make up the core band here. Adding substantially to four tracks is a three man horn section led by Joe McCarthy and baritone sax player Doug James (Roomful Of Blues, Duke Robillard, Jimmie Vaughan) plays on another track. Former Thunderbirds and Blasters pianist Gene Taylor appears on four tracks, Steve Kerin and Dover Weinberg adding keys to a further three tracks. Fellow Delta Groove artist Mitch Kashmar plays harp on one cut and adds backing vocals to another; Lisa Mann adds b/v to a further track. Jimi Bott engineered and mixed the album at his home studio in Portland. Kevin wrote all the material here which ranges invitingly across a range of blues styles. “Last Crossroad” changes the style again with some Delta style slide playing over an up-tempo beat, Kevin assailed by “that old evil feeling coming over me”. I particularly liked Jimi Bott’s ability to both drive the beat and offer some solo embellishments at the same time here. “Dancing Girl” has a riff that reminded me of “Lonely Avenue”, with Kevin providing a convincing vocal, his guitar working persistently round the core riff. “Midnight Creeper” is the longest track at just over seven minutes, starting with some shimmering slide on a steel guitar before Kevin picks out a riff for the rhythm section to follow. This is a trio performance with some more of Jimi’s great drumming and Kevin both singing and speaking the lyrics and then demonstrating his command of the Delta style of slide playing. “Walking Funny” has the largest contingent of musicians, with backing vocals from Jimi and Allen as well as Lisa Mann. The horns are back, as is Gene Taylor on a wonderfully swinging piece of jump blues. The lyrics pick up some of those old favorites – “Where did you sleep last night? Why are you walking funny? If you stay out tonight, better not come home again.” “Too Much Voodoo” sounds like an ideal title to visit Louisiana and Dover Weinberg’s swirling organ certainly adds to that feel, as does Kevin’s tasty guitar playing. An issue of concern in contemporary society is then raised (albeit in a humorous way) as Kevin explains that, having fallen on hard times, his new home is the “Second Box On The Left”. “The Blues Is My Home” is another acoustic slide piece with Kevin speaking the vocals as he observes that whatever happens, he will play his way through it. The album closes on a real rocker with “Put Me Back In Jail”, Steve Kerin’s rocking piano sitting alongside Kevin’s slide. This is a very impressive album which is recommend to all blues lovers as it covers many of the bases. I look forward to hearing more from Kevin and his band. Reviewer John Mitchell is a blues enthusiast based in the UK. Current favorites from recent releases include Chris Antonik, Shaun Murphy, Barbara Carr, Johnny Rawls, Andy T/Nick Nixon, Otis Grand and Doug Deming.